Available in Paperback or for the Kindle & iPad. Also in a Persian edition. Who lost Iran? How and why did a country, never richer, never more educated, its women never more liberated erupt in a fundamentalist revolution? the answer can be found in the enthralling life and tragic death of one man. Amir Abbas Hoveyda was a central figure in the historic struggle between modernity and tradition in Iran — a struggle pitting Western cosmopolitanism against Persian isolationism, secularism against religious fundamentalism, and ultimately civil society and democracy against authoritarianism. Born in Tehran in 1919 to a family of solid middle class comforts and faded aristocratic roots, Hoveyda was an elegant, cultivated, well-read, and witty man, educated in Beirut, London, and Brussels. After entering the Iranian foreign service in 1942, he served in France, Germany, and Turkey, then returned to Iran in 1956 to join the National Iranian Oil Company. In 1965, the shah appointed him the country’s prime minister. Hoveyda would serve faithfully in that post for thirteen years. Amir Abbas Hoveyda embodied the aspirations, the accomplishments and also the failures of a whole generation of Iranian technocrats — mostly Western-trained — who sought to free Iran from the travails of poverty and repression and guide it into the modern age. Hoveyda would be both a leader and a victim of that effort. On the eve of the Islamic Revolution, the shah, attempting to turn the rising tide of revolt by offering a scapegoat, ordered the prime minister’s arrest. When the Pahlavi regime fell, Hoveyda chose not to flee, voluntarily surrendering to the new Islamic authorities. His hope was for a public trial; instead the infamous “Hanging Judge” presided over a secret and summary trial. In telling the story of Hoveyda’s life, the author has not only laid bare the development of Iranian society during a pivotal period (1919 1978) but has also unearthed important new material on U.S.-Iranian relations. From 1957 onward, Amir Abbas Hoveyda played critical roles in dealing with U.S. foreign policy and fundamentalist Islamic opposition in Iran. Through careful use of hitherto-unexamined archival materials, unpublished letters, and personal journals, along with extensive interviews with more than a hundred of Hoveyda’s relatives, friends, and foes, the author has brilliantly caught the pathos and passion of Hoveyda’s life and times. 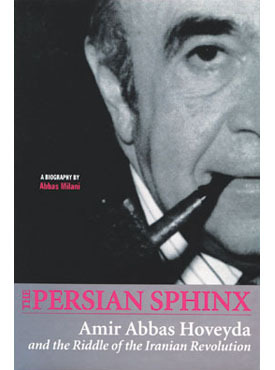 The Persian Sphinx is biography at its most powerful and will reward the scholar and the general reader alike. “An exceptional, emotionally blooded memoir. All his life, books had been his solace and passion, his sanctuary from the ordeals of the mundane. When he was free, history was the map by which he navigated the treacherous waters of what he once called the “Byzantine” world of Iranian politics. Now imprisoned, a captive of the Islamic Revolution, the past would become a portent of his future. By March 28, 1979, Amir Abbas Hoveyda, who had served the shah of Iran as prime minister for almost thirteen years, had been in jail for some five months. On November 8, 1978, in an attempt to appease the rapidly rising tide of revolutionary fervor, the shah had ordered Hoveyda’s arrest. There was no appeasing the tide, however, and fearing for their lives, the royal family fled Iran on January 16, 1979, with little realistic hope of ever returning. They took with them much of their personal belongings, including the royal dog. Their long-trusted prime minister, however, they chose to leave behind. On the morning of February 11, 1979, when the revolutionary tide-or squall-finally swept to power, Hoveyda was left all but unattended in his royal prison. In the chaos of the early hours his guards-all agents of the much-despised secret police, known by its Persian acronym of savak-had fled, fearing for their own safety. Rather than risk an escape attempt himself, Hoveyda chose to surrender to the new Islamic victors. He thus gained the ill fortune of being the highest-ranking official and the only prime minister of the ancien régime to fall into the hands of the Islamic revolutionaries. Five other former prime ministers-Ali Amini, Jafar Sharif-Emami, Jamshid Amouzegar, Gholam-Reza Azhari, and Shapour Bakhtiar-succeeded in fleeing the country on, or around, the eve of the revolution. Hoveyda spent most of his jail time reading, but on that cold March day, the only visible cot-side volume was an ornate, gilded copy of Islam’s holy book.2 He used the Koran not so much for spiritual guidance but as a source book to prepare his defense for what he had been led to believe would be his public trial in an Islamic court of law. Sometimes Hoveyda read romans policiers, as well. Since his youth, he had been an avid mystery reader. He preferred the French Série Noir, a specialized imprint in the tradition of American “hard-boiled” detective fiction by writers like Dashiell Hammett or Raymond Chandler.4 Recently, Hoveyda had asked his cousin, Fereshteh Ensha, for books about the French and the Chinese revolutions. The dreaded “revolutionary terror” he read about in those books, a terror at once self-righteous, unbending, and vengeful, was no longer a mere abstraction. Since the fateful day when he had surrendered to the new revolutionary forces, that terror, this time in an Islamic guise, had been shaping, and haunting, his daily life. In his salad days, Amir Abbas Hoveyda wore an orchid on the lapel of his dapper tailored suits. Francesco Smalto, an Italian couturier and tailor to the shah of Iran, was also Hoveyda’s tailor for many years. Lest he appear impertinent to the shah, who in the words of one observer suffered from “narcissistic grandiosity,” Hoveyda remained discreet about his use of the royal tailor.6 Less discreet were his colorful ties, chosen usually to match the color of the orchid he wore. Now he was mostly bald and wore a dark Nelson cap from which some strands of white disheveled hair escaped. He sat in a dark, rumpled shirt and matching pants. Over the shirt, he wore a yellow worn-out sweater. A pair of white, ankle-high athletic socks covered his feet, exposing his shinbones when he sat down. His cane stood next to the cot. He had first begun to use the cane in the summer of 1964, after a car accident left him with a damaged knee and fractured hip. He continued to carry it long after his rehabilitation. In the often-cynical world of Iranian politics, many saw the cane as more form than function,8 although since the accident, Hoveyda was often worried about losing his balance according to his physician. His critics said Hoveyda always had an eye for his place in history and he knew that in modern Iran all notable prime ministers had some idiosyncratic trademark. An opera hat, a fur cap, even pajamas and a blanket had served as ministerial trademarks in the past. Hoveyda’s cane, along with a pipe, and an orchid had become his emblems. But that was all in the past. Now weak, battered, though not defeated, he needed his cane to maintain his upright, some thought defiant, gait. By late March, Hoveyda was being held in Qasr Prison, where he had been an inmate for about two weeks. Before his transfer to Qasr, he had been incarcerated for a few days in the Madreseh-ye Refah (Welfare School), which was both Ayatollah Khomeini’s place of residence and headquarters for the incipient revolution. The school had been built as a bastion of religious training, a refuge from the secular education championed by the Pahlavi dynasty. Its founders included Shiite clerics like Ali-Akbar Hashemi Rafsanjani and Ali Khamenei, two of the Islamic Republic’s most powerful politicians today. The Refah School was established in 1968, just three years after Hoveyda had been first appointed Iran’s prime minister. The school’s location, next to two of Tehran’s most symbolically significant buildings, was full of historic ironies. On one side stood the Majlis building, on the other the Sepahsalar Mosque. The Majlis was the country’s House of Parliament and had come to symbolize the Constitutional Revolution of 1905 06 and its incumbent secular turn in Iranian politics. Hoveyda’s tenure as a prime minister had begun in 1965 when Hassan Ali Mansur, his close friend and Iran’s premier at the time, was shot by Islamic terrorists as he was about to enter the same parliament building. The gun used in Mansur’s murder had been provided by Rafsanjani. Next to the parliament was the Sepahsalar Mosque, a grand religious monument, which had served a role akin to Westminster Abbey in London. For more than half a century, the mosque had been the scene of every important, and official, religious rite or ritual held in the capital. The mosque had been built as an endowment by Hoveyda’s maternal great-uncle, from whom it also took its name. As one of the many beneficiaries of the endowment, Hoveyda’s mother received a monthly check from the mosque of 100 tomans. With the collapse of the Pahlavi regime, the Majlis, which had for many years been a mere rubber stamp to royal decrees and only a hollow shell of its constitutional mandate, now stood empty, almost derelict. The political center of gravity had switched to the school that for two decades had remained-literally and metaphorically-hidden in the shadow of its grand neighbors, quietly offering its strictly religious curriculum to a small and select body of students. During the first hours of the revolution, prominent figures of the old regime were rounded up and brought to the Refah School, tributes from a jubilant crowd to their new masters.Ý The arrival of the prisoners at the school created a strange cohabitation of the jailer and the jailed, a forced communion between the victor and the vanquished. Ayatollah Khomeini lived in a room overlooking the schoolyard. Prisoners were kept in another wing, across from the ayatollah’s temporary residence. In those feverish first weeks of the revolution, the small schoolyard was regularly filled with people who filed in, dutifully chanted their enthusiastic devotion to the new regime and their hatred of the old, and then filed out. It is not hard to imagine the terrible impact those angry, exuberant, and menacing voices must have had on the men and women held captive in the building. After conveying the ayatollah’s words of assurance to the prisoners, Bani Sadr and Ahmad Khomeini crossed the hallway to the room where Hoveyda was held in solitary confinement. He was the revolution’s trophy prisoner, and his private room was a token of this portentous status. There was a bed in one corner, a small, gray metal desk in the other. A threadbare Persian carpet, some twelve feet long, covered much of the floor. On the desk was a tiny tricolored flag of Iran; the lion and the sun-a reminder of the country’s pre-Islamic glories and, since the mid-nineteenth century, a symbol of the institution of monarchy-had been cut out of the center of the flag.16 A single window facing the yard was now locked and clumsily covered with old newspapers. Raised in Iran, Abbas Milani was sent to be educated in California in the 1960s. He became politically active and in 1974 received a PhD in Political Science. He returned to Tehran and taught at the National University but was imprisoned by the Pahlavi regime in 1977. After the revolution he became a professor at Tehran University, but by 1986 his utopian illusions had been shattered and he emigrated to the United States. Dr. Milani is the Hamid and Christina Moghadam Director of Iranian studies at Stanford University and co-director of the Iran Democracy Project at the Hoover Institution. His works include, Tales of Two Cities: A Persian Memoir, The Persian Sphinx: Amir-Abbas Hoveyda and the Riddle of the Iranian Revolution, Lost Wisdom: Rethinking Modernity in Iran, and a translation of Houshang Golshiri’s King of the Benighted.